It was no coincidence for Michael Baker to end up as a career musician. Surrounded by music and the arts from childhood, Sunday family dinners were always followed by impromptu concerts and opera arias. Both Michael’s parents were musicians. His mother Marcelle Lorieau and his uncles, along with a family friend, set the groundwork for the foundation of the Edmonton Opera Association. Uncle Maurice Lorieau led the formation of the Calgary Opera Association, and became the Association’s founding president. The list of family in the arts includes opera singers, musicians, graphic designers, painters, and European fashion models. Some are especially well-known, such as Paul Lorieau, anthem singer with the Edmonton Oilers, and Henri Lorieau, composer and Music Director for such stars as Tom Jones and Paul Anka. Another cousin, Pierre Lorieau, is a New York City lawyer and General Director of Opera Français de New York. In 1975 Michael was offered the Principal Percussion Chair with the Edmonton Symphony Orchestra. He declined this position in lieu of a simultaneous offer of Principal Timpani of the Mexico State Symphony (1975-77). 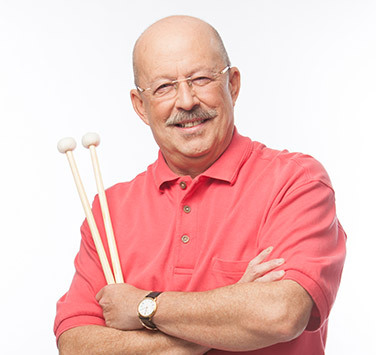 He then became the Founding Principal Timpani of the Mexico City Philharmonic (1978), Founding Professor of Timpani and Percussion at Escuela Vida y Movimiento, and Founding President of the Mexico City chapter of the International Percussive Arts Society. Michael has performed around the world with the Mexico City Philharmonic and the A-list of soloists and conductors. His first- and second-generation rosters of students in Mexico City perform now in 14 orchestras internationally, including the Zurich Chamber Orchestra. These students are also competition winners in New York City and founding members of various international ensembles including ScrapArts (Vancouver) and Tambuco (Mexico City). Others teach at five universities, including Northern Illinois University at DeKalb. Michael is married to soul mate Gabriela Woodrow and still thinks that second trumpeter Curtis Dietz should caddy for him next summer! Trumpet and piano, very badly – my first instrument as a child was a trumpet. But I always knew the drummers got the girls! Can you tell us a funny story about your experience with Symphony Nova Scotia? Back when we were working under Georg Tintner, one of our trumpeters, Jeff, was late for a rehearsal one day – so we dressed up a bassoon case in a winter coat and a toque, put it in his chair, and set a trumpet on its lap. Luckily for us (and for Jeff! ), Tintner didn’t notice… not even when Jeff showed up 45 minutes later. It’s the only thing I’m good at! …Is this a rhetorical question? What’s the best gig you’ve performed at? Why was it so great? I’ll never forget when Leonard Bernstein came to conduct the Mexico City Philharmonic for a gala concert for U.S. President Jimmy Carter. It was an incredible experience – the concert was such a hit that we had a line of people around the block to buy tickets for just the dress rehearsal! The concert itself was amazing, and was even broadcast live around the world on PBS. Zappa, Boz Scaggs, and Mahler. What’s a fact that nobody would know about you? I can’t tell you that either! Who is the person who most influenced you, and how/why? I’m a Heinz 57 – there are too many too mention. We all are – you learn from so many different places. Chicken mole. Mole is a chocolate and peanut sauce, and if you get the real thing in Mexico it’s an extraordinary flavour.